Turn your iPhone or iPod Touch into a mobile field guide to urban pests with the iPest series. Each volume of the iPest series is designed to be a handy guide for anyone dealing with urban pests including homeowners, renters, pest management professionals, naturalists, IPM coordinators, building managers, teachers, and students. You will find that this guide is a practical way to identify and educate others about common urban pests. 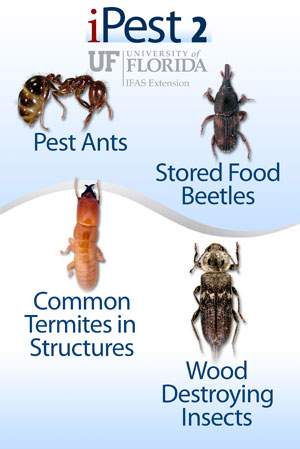 iPest1 contains four sections covering pest cockroaches, filth breeding flies, occasional invaders, and urban pest and wildlife droppings. iPest2 contains four sections covering pest ants, stored food beetles, common termites structures and wood destroying insects. 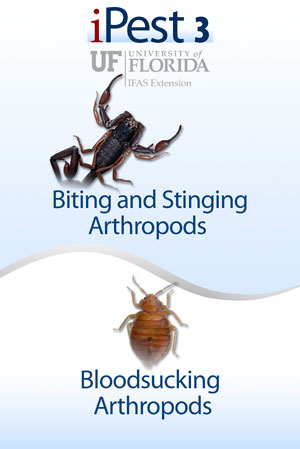 iPest3 covers biting, stinging, and bloodsucking arthropods. A searchable menu groups pests by type and allows you to quickly find your pest of interest. A Favorites option allows you to save common pests for swift reference. The guide provides high-quality color photographs with marked identifying characteristics and a silhouette of the actual size of the main pest species. The photos detail the identifying characteristics of the pests with clarity and are provided in three size options, fit to the screen, actual size in silhouette form, and an expanded view. Images may also be zoomed in and out to reveal detail such as wing venation, body segmentation or setae. Many of the pests and occasional invaders have additional photos of the pests in their natural environment, and the Urban Pest and Wildlife Droppings section provides you with an image of the droppings in addition to a background photo of the pest animal. 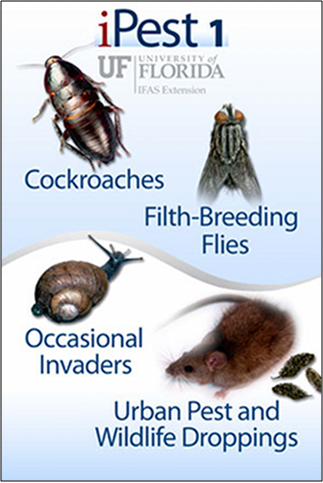 Each pest has a Facts section providing information about habitat, biology, behavior and distribution within the US. iPest requires an internet connect to download, but is a standalone application. You will not need an internet connection to access the pest ID guide. This makes it a useful tool for anyone working in the field. Be sure to check out iPest1, iPest2, and iPest3. More Information: Online links for printed materials, web sources (including management strategies, from the University of Florida IFAS extension), and Pest Training opportunities for pest management professionals. Help: A general overview of the navigation while using the iPest app. Purchase now through the App store for only $1.99 each! Proceeds help fund extension programs in Urban Entomology.